The teams now head to Kansas City for the second leg on Thursday. 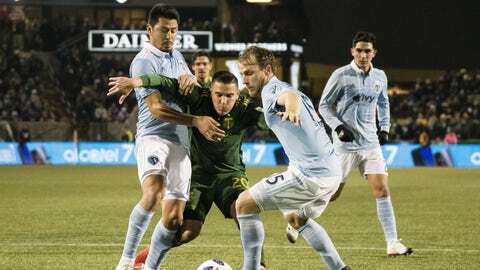 Tim Melia made six saves and Sporting KC survived Portland’s aggressive attack at home for a 0-0 draw on Sunday. The teams now head to Kansas City for the second match Thursday night. The Timbers outshot Sporting 14-9 and had six shots on target but couldn’t break through. Portland goalkeeper Jeff Attinella made one save. Atlanta United beat the New York Red Bulls 3-0 in the first leg of the Eastern Conference finals earlier Sunday. Sporting finished the season as the top seed in the Western Conference and earned a knockout-round bye before a 5-3 win on aggregate over Real Salt Lake in the conference semifinals. The Timbers, the only team that played a knockout round match that remains in the playoffs, advanced to the conference final on penalties (4-2) to cap a wild semifinal with Cascadia rival Seattle. While not getting the win at home was far from ideal, Portland prevented Kansas City from netting an away goal, which is crucial in a two-legged final. Sporting was without forward Diego Rubio for the opening leg because of yellow card accumulation. He was replaced in the starting lineup by Khiry Shelton. Graham Zusi, who was questionable going into the match because of a thigh injury, was in Sporting’s starting lineup. Zusi has played every minute of the 2018 season so far. The Timbers were without Andy Polo because of a calf strain he sustained on the international break. Dairon Asprilla started in his place. Forward Samuel Armenteros was not available because of back spasms. Portland was hurt when defender Larrys Mabiala left with a non-contact injury to his right leg in the 18th minute. He was replaced by Bill Tuiloma. The Timbers saw a good chance early, but Jorge Villafana’s blast in the sixth minute hit the post. Liam Ridgewell’s header in first-half stoppage time was punched away by Melia. Portland appeared to score in the 70th minute, but David Guzman’s rebound goal was called offside and VAR confirmed it. Portland’s Diego Valeri said he thought his team played well, despite the absence of goals to show for it. Sporting made only one shot in the first half, with eight coming in the second as it stepped up its attack. Kansas City, which won MLS Cup titles in 2000 and 2013, led the Western Conference (and was second in the league) with 65 regular-season goals, a club record. The Timbers won the MLS title in 2015. Last season Portland was eliminated from the playoffs in the conference semifinal against Houston, and afterward coach Caleb Porter and the Timbers parted ways. The Timbers are playing their first season under Savarese. The winners of the conference finals meet in the MLS Cup final Dec. 8.